MACOMB, Alexander (1782-1841) was the Commanding General of the United States Army from May 29, 1828 until his death on June 25, 1841. Macomb was the field commander at the Battle of Plattsburgh during the War of 1812 and, after the stunning victory, was lauded with praise and styled "The Hero of Plattsburgh" by some of the American press. He was promoted to Major General for his conduct, receiving both the Thanks of Congress and a Congressional Gold Medal. Manuscript Letter Signed “Alx. Macomb Maj Genl.” 1pp. 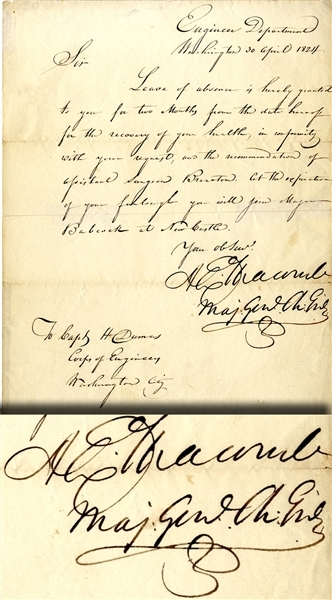 quarto, Engineer Department, Washington, April 30, 1824, addressed to Capt. Dumas, and reads in part: “...Leave of absence is hereby granted to you for two months from the date hereof for the recovery of your health...” Fine condition.